Most people think of the fighting sport when I say MMA, but my two children are true MMA champions, and here is their story. I will never forget the day my first child, Sarahya, was born. She was so fragile, at only 3 pounds 4 oz., but she was perfect to me. She struggled to grow and survive in my womb, which is why they took her out at only 35 weeks along. Right away she struggled to survive outside my womb as well. She wouldn't eat, and the formula and breast milk both made her even sicker. No one knew what was wrong. Then after a few days, the newborn screen came back and showed an abnormality, a genetic disorder called methylmalonic acidemia, or MMA. They wanted to run the test again to be sure. Methylmalonic acidemia, it was such a big and unfamiliar term. Of course I went to google and researched it. I was horrified. As I read about how often this disorder can be fatal, and how it can cause things like kidney and liver failure, mental retardation, low muscle tone, and a continuous list of other lifelong disabling conditions, I just felt completely overwhelmed and in shock. I never imagined I would ever have a child with a disability. I always pictured having a healthy and happy child; smart, beautiful, ready and able to take on the world and achieve more than I could ever imagine for myself. I think all parents desire these traits for their children. With one diagnosis, between the doctors and a google search, those dreams should have gone out the window for me, but my heart told me otherwise. At about day 10 in the NICU, the second test came back, and it was confirmed that my baby girl had MMA. I remember the metabolic doctor and the nutritionist came to speak with me. They brought a box of Kleenex into a small room, so I knew right away that this would not be an easy conversation. They explained to me that MMA is caused by two non-working genes, one from the mother and one from the father. MMA is extremely rare; in fact my daughter was only the second diagnosis of MMA in all of Nebraska, and the only MMA patient in Omaha when she was born. The chances of a child being born with MMA in the general public was about one and 100,000, (although with increased newborn screening, this number is now more like one in 25,000- 50,000) but between two carriers of the nonworking gene there is a 25% chance. This took me back to biology class when I learned about recessive and dominant genes, but this was something I had never learned about. In fact, most doctors don't even know much about MMA. So the big question was how this disorder will affect my child's life. Of course I addressed everything I read on Google about the chances of fatality, the chances of liver and kidney failure, the chances of mental problems, etc. I was reassured that with early detection and proper treatment, MMA is not always pure doom. Of course they also explained to me that this would not be an easy road, and my child would not be like a normal child. There would be complications, there would be hospital stays, there would be a daily routine of medications and controlled diet. MMA patients do not have the enzymes to break down proteins in the body; therefore they must have a protein restricted diet. This means no meat, no beans, no eggs, limited dairy, and a special formula that I had never heard of, as it is not available on store shelves, or even at the local pharmacy. There was a whirlwind of information being thrown at me, in this tiny room, with a box of Kleenex at my side. I was simply at a loss for words. I didn't know how to feel, or react. I cried for a while, and used up a bit of that box of Kleenex, and by the end of the meeting, I knew I had to compose myself. I told myself that there would be no place for these tears around my child. If I showed any dismay, any inkling that I might lose hope for her, she would sense that and she would not fight. I had to be strong, so she would be strong. Parents must set the example for their children, and my first example to my daughter would be to be strong and to fight. Another 4 and half weeks passed in the NICU. Sarahya was started on the special low protein formula, but she still would not take it my mouth, so she had to have a feeding tube inserted. She had a whole other list of complications, not necessarily related to the MMA. Since she was preemie, she had to be in the incubator for quite a while. She also had problems with her stomach becoming distended, so she was on TPN off and on during that time as well. It seemed that for every step forward we took two steps backwards. But she kept fighting, and after six weeks in the NICU she was finally healthy enough to go home. The day I took her home she weighed 4 lbs. 14 oz. She was the tiniest, cutest little baby had ever seen. She went home with no feeding tube, no extra medical supplies other than a list of medications and her special formula. I had no idea how short of a time this would last. About a month later the hospital admissions began. It seemed there was always something going wrong. She would not eat well enough by mouth, and was not gaining weight well. When a child with MMA does not eat well enough, their body goes into starvation mode. Just like anyone who tries to starve themselves to lose weight, the end result is a breakdown of muscle rather than fat. When an MMA child breaks down muscle, they are breaking down protein. Since their bodies cannot effectively break down protein, they end up getting very sick. The ammonia levels in their bodies’ rise, which often times results in brain damage. It was a constant battle to keep my daughter from getting sick. Either she would not eat well enough, or she would catch some kind of bug at daycare which would cause her to give very sick and her ammonia to give very high. Every time she got sick it was a very scary situation. I would rush her to the hospital to check her ammonia and they would have to put an IV in to give her fluids, and of course a feeding tube to feed her, and she would have to stay in the hospital for days or weeks at a time. It was a routine that I just became used to, and I accepted it as my new normal. I did not care what it took; I just wanted my child to survive. 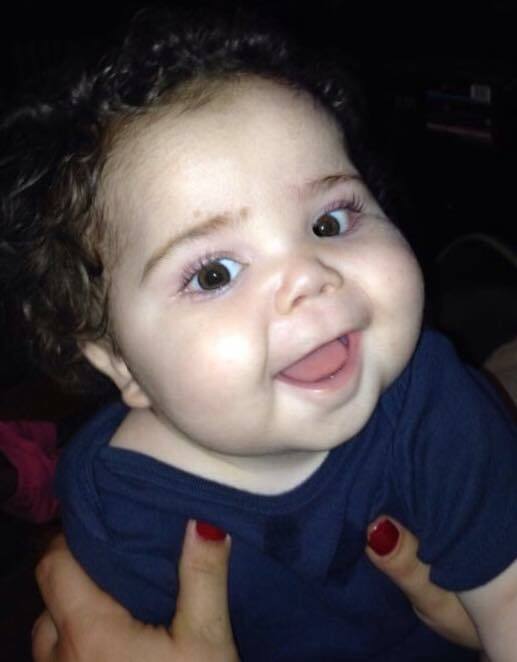 At six months old Sarahya had surgery to get a permanent feeding tube, which is called a G button. It was a difficult decision, but the best decision because she had a better solution for her nutritional needs. Also she did not have to have a tube down her nose anymore, and I no longer had to put it down her nose and worry about the risks associated with that. She did great through her surgery and recovered quickly. When Sarahya was seven months old, she became very ill and her ammonia got so high that she fell into a coma. I believe that was her 13th hospital admission. It was the most terrifying moment of my entire life. I remember that day so well. It was probably around three or four in the morning, and I happened to check on Sarahya and noticed her eyes were rolled in the back of her head. I tried to wake her, but she was unresponsive. She was just lifeless. I rushed her to the emergency room, and the entire time I was driving all I could do was pray. I think I went 70 mph to that hospital, and it was like the streets were cleared for me, probably because it was 3 am. Anyhow, when we arrived at the hospital they rushed us back into a big room, not like the other ER rooms we had been in before, this one was huge, and bright, and there were medical instruments of all sorts. This room was equipped for true emergencies, for life threatening situations. I stood and observed as about a dozen medical professionals stormed that room, attaching my baby to all sorts of medical equipment. They drew blood on her and started an IV, and she didn't make a sound or move at all. I never thought there would come a day that I would want to hear my baby cry from the pain if being poked. It just seemed like she was gone, she just lay there, lifeless. I was a nervous wreck; I could do nothing but cry and pray. I felt so helpless, I just wanted to do something to help her, but all I could do is keep praying. The lab results came back after about 30 minutes, and her ammonia had skyrocketed to over 700. This was devastating as normal range is between 30 and 70. I knew the risk of brain damage that comes from high ammonia. Even ammonia as high as 100 can cause lifelong brain damage, so I was terrified at what over 700 would do. They admitted Sarahya to the PICU that night. They continued to give her IV fluids and TPN, which is nutrition through the veins rather than a feeding tube. They told me there was nothing left to do but wait. They explained to me that the chances of her waking up were slim, and if she did, there was still a risk that there was swelling on her brain, and she may not survive that. They also told me that even if she made a full recovery, she would likely be mentally handicapped, and may not be able to learn to walk or talk. I felt so helpless. I thought how could this be happening? This must be a terrible dream, it just can't be real. I didn't sleep that night; I just sat there and prayed. I prayed so hard that I don't think I've ever been closer to God. I asked him to protect my child, to bring her out of this safely. I sat and l held my baby's hand, and sang to her. She has always loved when I sing to her. I just knew she had to be in there somewhere. I just knew she would fight through. I reminded myself again that there was no place for tears here; there was only room for hope. I spoke to her and told her to keep fighting. I told her how much she was loved. I told her not to give up, and to come back to us. The next day, family came to visit, and I had to explain everything the best that I could, over and over. I found myself reassuring everyone else that my child was a fighter, and she was going to survive. That day and the next, not much changed. She stayed unconscious, and I continued praying. On the fourth day, my mom arranged for the pastor at her church to come and anoint Sarahya and pray for her. Actually two different members of the church staff came that day, which I very much appreciated. The elder who came and anointed her stayed for a while and comforted me. We had a long conversation about my feelings at the time. I revealed to him that I was having feelings of guilt that maybe my child was suffering as some sort of punishment for my past sins. I explained that although I had asked God for forgiveness, maybe I was not forgiven because I had been a hypocrite at times and continued to commit the same sins after I had asked for forgiveness. I could not wrap my mind around how I could truly be forgiven even though I am still a sinner. The elder then looked at me and said something that would change my life forever. He pointed to my lifeless child and said "that is your child correct?" I said "yes." He said "is there anything in this world that she could do that you would not forgive her for?" I said "of course not, that is my child." Then he replied, "That is exactly the way our father feels about us." I just began to cry so hard, and I was so humbled, so thankful that my father, my God, loves me so much that I can be forgiven, even as the sinner I still am today. I still cry every time I think or talk about this, and I am crying now as I write it. That day, my relationship with God became stronger than ever, and my faith became unwavering. Immediately after that, I was saved, right there in the PICU, next to my unconscious baby girl. I knew without a doubt that from then on, nothing could hurt my baby. I just knew that she would survive, and she would be just fine, because God would protect her. The very next day, Sarahya began to wake up. It was a slow process; she was still very out of it at first. The doctors were still not very optimistic, and continued to remind me that she was still not out of the woods. They expressed to me that although she was waking up; we had to wait a few more days to see how her brain would react. The days went by and she slowly became more and more alert. At about the 10th day, she was fully alert and showing many signs that her brain was working fine. In fact she even seemed to gain some skills that she did not have before the coma. For example immediately after waking up she was able to put her own Binky in her mouth, which she had never done before. After about a week and a half in the PICU, she was moved to a regular hospital room. She spent another week and a half in the hospital, and went home on her tube feeds and TPN. The ER doctor and PICU doctors were at a loss for words. They came to visit her before she left the hospital, and told me they had no explanation for her recovery. They actually said it was miraculous. I felt so humbled and blessed, for doctors who have a scientific mindset to use the term miraculous was simply amazing. I knew that God had truly blessed me and performed a miracle in healing my baby. The months went on and Sarahya had many, many more hospital admissions. I learned so much, I was not only a new mother, but I also became a great researcher, and nurse. I learned how to change TPN, as she was on TPN at home for seven months. Sarahya continued to get better and better. It was still slow progress, but I knew she would be ok.
She started therapy to help her catch up, as she was significantly behind in her development. She started physical therapy and occupational therapy when she was 16 months old. She began to sit up on her own at about 20 months of age. Then she began crawling shortly after that. She also began to eat by mouth around that time. 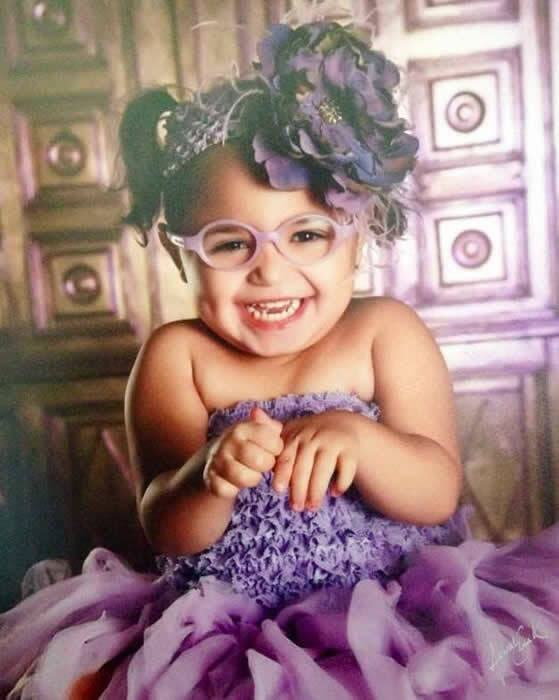 After about six months of feeding therapy, Sarahya did not need her feeding tube anymore. Slow and steady wins the race they say, and Sarahya proved that. A week before she turned 2 years old, Sarahya took her first independent steps! I don't think I've ever had a more proud moment in my life. They said my baby may never walk, but she achieved it. Over the next year Sarahya continued to get stronger and stronger. She began speech therapy to help her learn to speak, and continues to progress. She also began to show us her personality, and boy does she have personality! She loves attention, she loves praise, and she loves to perform! My biggest fear out of everything was that my child would be mentally handicapped. I decided early on that I was not going to just accept the fact that she would be mentally handicapped. I decided that with enough work, with enough perseverance, she could overcome any obstacle, including any learning disabilities may have. So I began to work with Sarahya on things like body parts, shapes and colors, numbers, and her alphabet at a very early age. To my amazement, she caught right on. By the time she was 2 1/2 years old she knew her entire alphabet, she knew all her shapes and colors, she knew her body parts, and she could count to over 50. She amazes me every day. Now Sarahya is 4 years old, and although I am biased, the smartest 4 year old I know. She can read over 100 words, she can spell her name, and she can count to over 100. She is learning some sign language now, and learning to speak some Spanish and Chinese! She just continues to learn new things every day, and she's like a beautiful sponge. I know that God picked me for this challenging gift. I cannot wait to see what else she can accomplish through her strength and perseverance. She has taught me how to truly love, and never give up. She's also taught me how strong I really am and how strong and tiny little child can be. I feel so blessed to be her mommy! God not only blessed me with Sarahya, but he blessed me with another child, Xayvior. Xayvior is 17 months old, and he also has MMA. Thankfully up to this point, Xayvior has not had near the complications that Sarahya had. He was born full-term, at 7 lbs. 11 oz. He was diagnosed with MMA through and amniocentesis while I was still pregnant. This was very helpful because we were able to treat him from the moment he was born. He has had a few hospital stays, spent some time in the NICU when he was born, and has some developmental problems, but overall has been very healthy. He also has a G button, and is just learning to eat by mouth. He does not sit up well on his own yet, or crawl, but he gets a lot of therapy for these issues. He is a little guy, which is typical of MMA children overall. He loves to watch his sister and I'm sure in no time will be playing and learning from her. It can be discouraging at times, watching my son and realizing that he is smaller and developmentally delayed compared to other children his age, but I only need to take one look at my daughter and know that Xayvior will catch up too. I refuse to give up on either of my children. The same old pattern of one step forward and two steps back continues, but the ultimate goal remains the same. MMA is commonly known as a popular sport in fighting. I am blessed to be the mother of two true MMA champions! My babies are in a fight for their lives, and they reign victorious through God's will!! Mother of MMA Champion, Sarahya A. C., and Xayvior S. S.